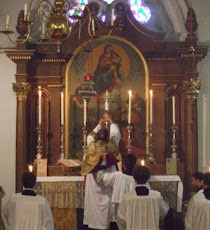 Fr Hunwicke's Mutual Enrichment: "PIETY/PIETAS/GODLINESS"
Today's Sunday Collect in the Old Roman Rite and in the Ordinariate Rite is a beautiful and ancient prayer asking God to guard (custodi) his Household (familia) with "continua pietate". Pietas is the word which gives us the English term piety; but there is rather more to it than that. After all, the English word piety suggests a humble human attitude of devout religious attention to God. That is misleading. And it would confuse you as you read this particular prayer: after all, God isn't pious towards us; We're supposed to be pious towards him. Pius is a Latin adjective and pietas is the noun that comes from it; pietate is what's called the Ablative, so pietate means "with pietas". And what these words refer to is the sense of duty and obligation which somebody has towards those to whom he is bound by bonds of kinship or religion or country or friendship or whatever. In Vergil's epic the Aeneid, the hero is called "Pius Aeneas" because he is dutiful to the Gods (he rescues the sacred Palladium); to his country Troy (for which he fights as long as possible: when there is no further hope, he guides its remnants to a new country); to his Father (whom he carries out of the wreckage of Troy upon his shoulders); to his friend Pallas (an adolescent whose death in battle Aeneas avenges in the bloodthirsty climax at the end of Book XII of the Aeneid). So ... does pietate in this collect mean (1) our devoted duty to God, or (2) his covenanted loving-kindness to us? In his English translation, Archbishop Cranmer got it wrong and thought it meant the former (1): so he rendered it as "true religion" (and, in another similar collect, "godliness"). Experts are agreed, however, that it means the latter (2). But Cranmer was aware of the two possibilities: for Epiphany 1 he correctly rendered caelesti pietate ('heavenly pietas') as "mercifully". In fact, there is a slight difference between 'ordinary' Christian speech and the usage of prayers like the collect we are considering now. In more 'ordinary' everyday Christian Latin, for example, in sermons, pietas refers to human attitudes towards God more often than the other way round; in prayers, the word most commonly refers to God's loving attitude towards us. As it does in this collect. This may be a spin-off from the way that, in Roman Imperial circles, people addressed the Mighty. Another possibility is that this may be another example of how 'Christian Latin', as used in prayer, adopted much of the style and vocabulary of very ancient pre-Christian Roman prayer-language; a process brilliantly documented by Christine Mohrmann. Abp Cranmer may have got it wrong grammatically, but in my only occasionally humble opinion, the sentiments of the resulting collect speak directly to the heart here in the 1st half of the 21st century.